Each year 200 trees are decorated on the avenue Champs Elysees in Paris with a clever design. There's a carnival atmosphere in stores marked rush of purchasers, and the thermometer hints at the approach of winter. Yesterday The Christmas spirit lit up the Champs Elysées as the famous avenue was given a seasonal makeover. 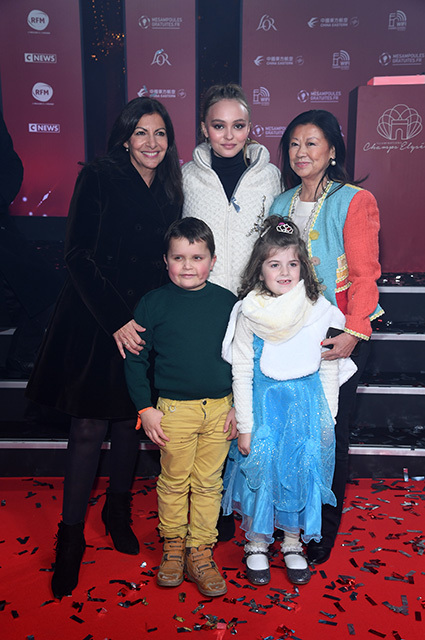 The event was attended by model and actress Lily-Rose Depp. For the ceremony, the daughter of Dzhonny Depp and Vanessa Paradis chose a very appropriate outfit, it is absolutely appropriate to weather conditions: Lily posed for photographers in a white down jacket with a picture of the Eiffel Tower, a black turtleneck, jeans and high boots with a small heel. It is worth noting that Lily gets from parents all the best: the external data and a sense of style, which she got from her mother. Young model can perfectly combine the simplicity, comfort and elegance, and each of her appearance did not go unnoticed.